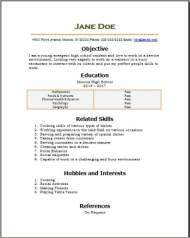 These Free High School Resumes we created for you are easy to download and also easy for you to edit in the Microsoft Word program on your computer. So please do spread the word around to all the great friends you have that are looking for a job while they are in high school. When you decide to download--the zip file will pop up, then just click OK and the file will open, double click on the doc file to open it up, then choose file save as--where-save on Desktop--leave the file name exactly like it is now. That way when you start to edit this resume, you will find it very easily right on your desktop. So it is really easy with no fuss. Use these 3 free high school resume formats, by completely editing them filling in your personal job details after you have the one you are interested in downloaded on your computers desktop. The easiest and fastest process would be for you to get this completed is backspace through our high school example choosing only one sentence at a time, and replace our example sentence with your very own specific information. This task may take you awhile, but if you have your current information in front of you, it can be a lot easier to complete faster. Then all that is needed is choosing the high school resume you think that you like out of the 3 options. It is oh so very easy. Yes, we have made this simple, very fast and also time saving for you so you can easily create your new free high school resume. This should only take you just a small amount of your time. Your chance of landing that part time job you are after will be greater after you take the time to complete one of our resumes, it will help to show your employer you are a prepared person. 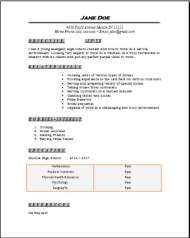 Do you need a high school resume? Well I always say be well prepared and show them you are interested in being more informative. If you are proud of what you have accomplished in high school and you have some good grades or belong to social clubs, then yes, I think they would be somewhat impressed by reading your resume. 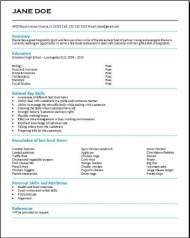 We do have a Resume Reference Page you can use if you want. Give it to them later at the interview, don't put it on your free high school resume for now. Although you will be filling out an application for employment, I still think it is a good idea for you to have a well prepared resume. This will also be a great asset to you when you do fill out the application as you will already be prepared with all the info you need. Here are some other Headings I think you should use. We have also added these to our examples to help you even more. You might consider adding any awards you may already have from your school programs. Not to worry. Training is always available from the employer, they want staff to be well prepared for their position they get hired for. Make sure you are alert and focused on the new person whom is offering their time and training expertise to show you the ropes.